I have had this set for six years..still has a great picture and I would not be selling it if Dell had not ocme out with a specail for a Mistsubishi 64 in 3d rear projection tv for $720. This TV has never had the bulb replaced so I expect it will need to be soon and will still provide a clear sharp image. I am avid x-box player and I have loved this set. Again rear projection dlp TVs are a great investment over Plasam and LCD. Great HD picture for the 12 months that the unit worked. Sony Grand WEGA - KF-50WE610 purchased from Circuit City in December, 2003. Unit worked flawlessly until early 2005 when vertical red pin-stripes began to appear across the entire screen. Later, blocks of totally red areas appeared randomly on the screen. And finally, a red, reverse image of the actual picture now appears making it impossible to watch the 'game'. Numerous calls to the local 'authorized' repair agent have resulted in absolutely no service at all! Do not under any circumstances purchase this unit. Bright picture. Good color temp. Plenty of inputs. Easy setup. Easy to use menus. Memory stick slot. DVI input. Had thbis unit only 20 days and I now have the burned out bulb indicator lit. Purchased May 2004. This unit is serial nbr. 9147082 so it should not have the bulb troubles of early units. Will try and get this unit fixed. If it happens again will move to the Hitachi LCD. Great set. Nice features. 480P-1080i sources look great. Low quality control. The price of the stand. Picture quality is second to none! I did a great deal of research on tv's before deciding on this one, I am not disapointed at all. Good picture when it works. It doesn't work very long! Bought the KF-50WE610 at Bet Buy and it broke (wouldn't come on) after two weeks. Best Buy cpould not give me a date when they could repair it and said they reccomended that I return it to them and get a different set: they do not stock this model anymore because of all the problems they have experienced. Bought an Hitachi 50v500 and have been very pleased. As learned from the Management Team at Best Buy, Sony has issued a recall on this TV. I have had this unit for just over a month and come Christmas day with 32 family members present, our TV would not turn on. As I understand it, the bulbs are getting too hot??? I have not received a recall notice as of 12/31/03, have any of you? Great picture, good sound, sleek look, just the right size for a modest viewing area(smaller than 20x20)Price is right if you're not a rap star...yet. Expensive Sony stand that is a rip. ($500-$600)Good height(15") but useless for components or movie shelf. Bought a Sanus made in New Zealand(22") @ Best Buy for $300, so I also got a new DVD player to match(all silver) for less than the Sony stand alone! Three shelves and perfect for all components, and looks perfect for set. Instruction manual a bit confusing and needs a real thorough reading. Also, you probably have to do a lot of experimental hook ups to components to get your sitch just right. Write me if you figure it out. Lastly, if true, 2000 hours max on bulb, that blows, literally! Unless you're a rap star. I just purchased the 42" version of this set and so far so good. Picture quality is great with DVDs using proscan(using standard picture setting/widescreen.) Seabiscuit was awesome to watch with such superb detail from great cinematography. Old school remastered films such as Lawrence of Arabia looked new. Colors are vivid and pictures sharp. Pirates of the C is very fun to watch. Sound is crisp and true(Use optical hookups). Aso played Nemo and Monsters Inc. and for any quality animation, this set was made for. Detail was outstanding and sound accurate(I believe Disney films have quality recordings. )Be picky about quality and format of DVDs or you will be disappointed. Still waiting to hook up TV to HDTV box but assuming it will be very good as it showed in the showroom. Speakers on set are sufficient if not hooked up to an A/V reciever, but you might as well get one for this kind of set. The instructions are a bit confusing for some of the hook ups and not to keen on the Twin View(PIP) mode. I have component DVD and can't flip back and forth to cableTV b/c of predetermined inputs (there are 7 inputs. Can watch/flip from VHS to DVD, as well as cable to VHS. Maybe too frustrated to figure out now. Salesperson said that replaceable bulb will last about 2000 hours which I figured to be a year? (40 hours/wk X 50 weeks). Hope the bulb is not too expensive! 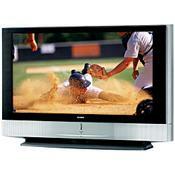 I purchased the Sony Grand Wega KF50WE610 from Sears after making comparisons between it the Hitachi and Samsung . I went to several stores including Sound Advice, Circuit City and Best Buy. The Sony looked consistantly better but I realize that individual store adjustment could account for that. However, when it showed up at my house, Whew!! Right out of the box it looked grand. A week later I got my High Definition reciver, had it installed and I am happy, happy, happy. I thought that my Hitachi Ultravision was sharp but the Sony is great. I am using it as a monitor only coupled with an Onkyo 787 receiver, a Hughes H/D Receiver , NHT 1.5 fronts, super center, sub-one, and superones as rears. I refused to buy the stand for $600 . Went to BJ's Wholesale Club. Bush makes a perfect match for the Sony that sells for $169 . My only question is whether I can get a better picture by having it professionally tuned, if there is any such thing. If you want a great picture at a fair price this is the way to go. So far none at this time, but for the Stand they want $599.00 for a stand! I did not give a overall rating at 5 because of the stand. So far so good, I just had this Sony LCD 50WE610 for just a week. It shows just Great, DVD movies looks 3D, and with the BOSE Lifestyle 25 surround sound you feel the movie. I just order some S-Video cables to hook up. I can't wait until the cables come in. If you are looking to purchase this item, I say go for it now, because it is getting hard to order the Sony 50WE610. You can't order the 42WE610 anymore. I was looking for a Plazma, boy am I glad I waited. I first seen the Hitachi 50V500, and thought that was the one for me, until I went to Sears and seen the Sony sitting right next to the Hitachi. The Sony blew the Hitachi right out far as picture. I am so glad I did not spend the money on the Plazma.